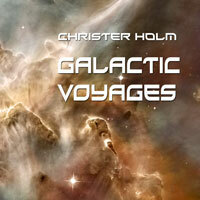 Continue your journey into space with this new video from Galactic Voyages. A video for an old C64 remix of mine. A modernized version of the old classic intro music by my favorite C64 composer Matt Gray. True to my style, I tried to make it as close as possible to the original. I use a deep male choir for the melody itself which creates a terrific sound of impending danger. The sample was from a small 20mb SoundFont and it still is one of the best choirs I ever heard, even today with choir libraries of dozens of gigabytes. Other instruments are either from AKAI sample CDs or Roland JV-1010. The drums are from an Alesis QS6.1, which is still my main controller.